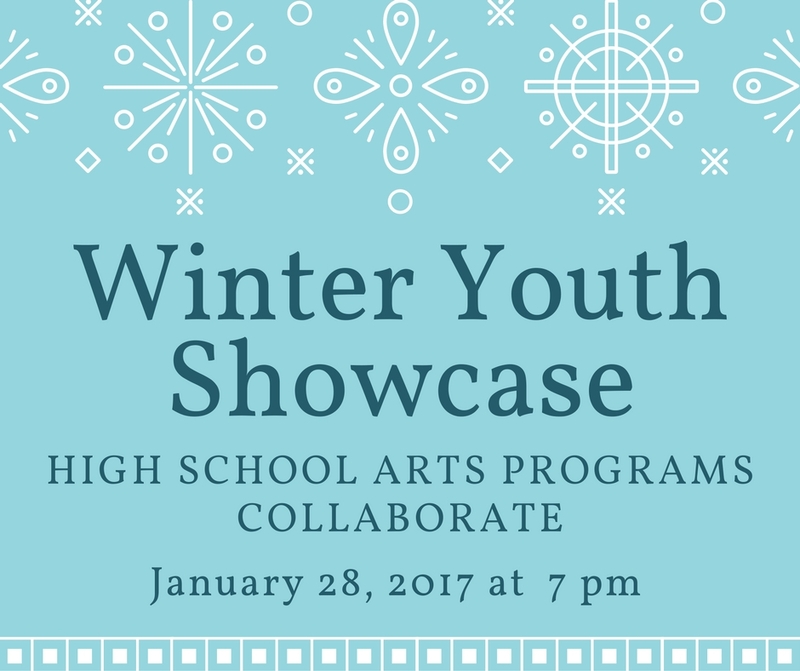 January 28 at 7 p.m.
High School education and arts programs collaborate as actors, artists, dancers, musicians, and vocalists share their talents with the audience. All January – Sunday movies at 2 p.m.
March 4 at 7 p.m. 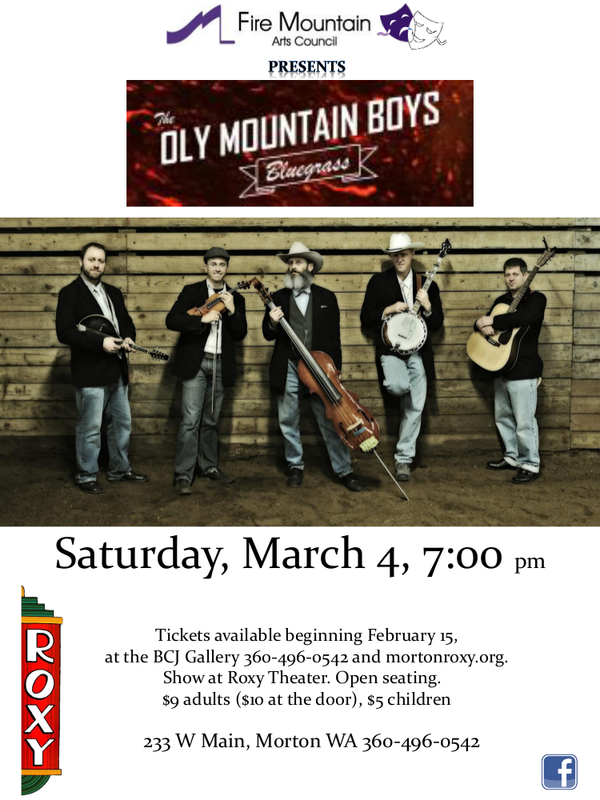 The Oly Mountain Boys play bluegrass with high-energy drive and a Pacific Northwest bent, mixing traditional tunes with revolutionary bluegrass compositions. By combining picking prowess with tight three-part vocal harmonies, the band aims to showcase the power and appeal of a truly American musical form. March 18 at 7 p.m.
Three brothers playing the guitar, bass guitar and drums entertain with lively music and song. 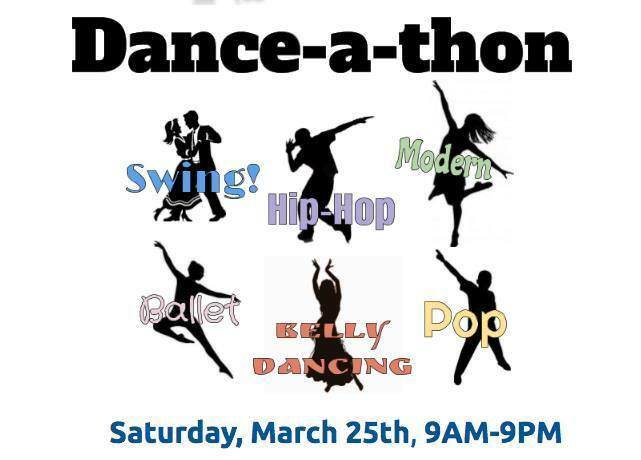 March 25, 9 a.m. – 9 p.m.
Dance all 12 hours, only dance to certain songs, or just watch. Choose your own way to dance! Come out and support the Kids of OnStage Children’s Theatre Education Program in their Spring production, at the Tiller Arts Center in Morton WA. Lots of music, refreshments, and of course DANCING! Help us celebrate the rain! 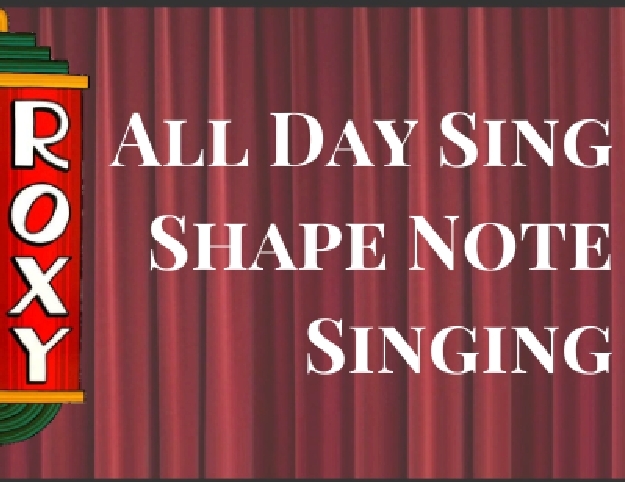 April 8 at 4 p.m.
Help us “celebrate the rain!” Enjoy a large screen sing-a-long, and armchair aerobics. Participate in the Umbrella Parade. Win door Prizes! Enjoy refreshments! Festival will be followed by a rain-themed video at 7 p.m.
June 3 at 2 p.m. Enjoy children ages 3-15 dance to tap, jazz, creative movement, and lyrical dances. Thursdays, April 13 – June 1, Noon to 12:50 p.m. Speakers on a wide range of topics—join us in learning! 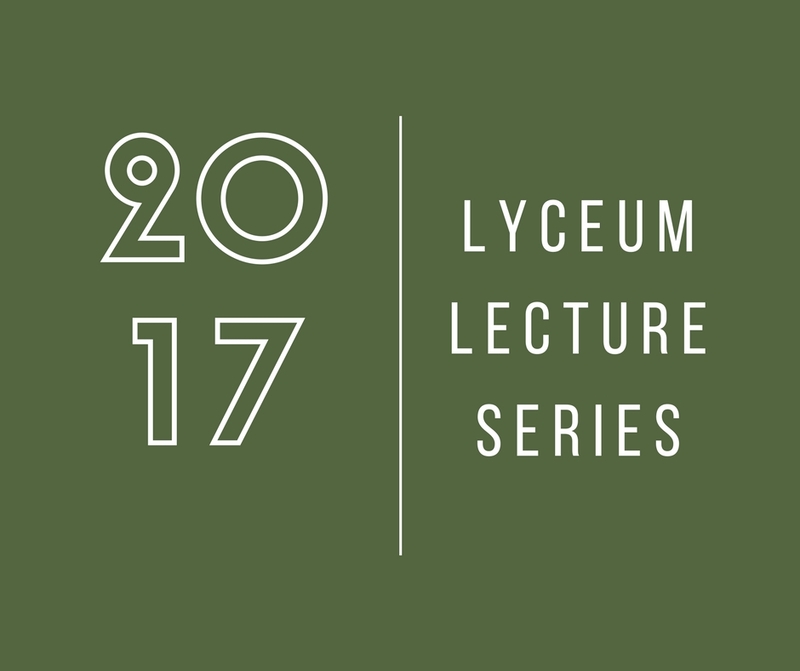 Drop in for individual lectures, or register for the series for $25. Contact Centralia College East for the lecture schedule and to register: 360-496-5022. June 10 at 9:30 a.m. The 5th Annual Roxy Golf Tournament at Ironwood Greens, Glenoma, features 50/50 raffle, prizes, and events such as: Long Drive for men and women, Nearest the Pin for 2 holes for men and women. Participation fee of $30/person includes 12 holes and a complementary Roxy Theater movie ticket. Thanks for supporting your community theater. June 25 at 4 p.m. The Total Experience Gospel Choir bursts with love, joy and enthusiasm. 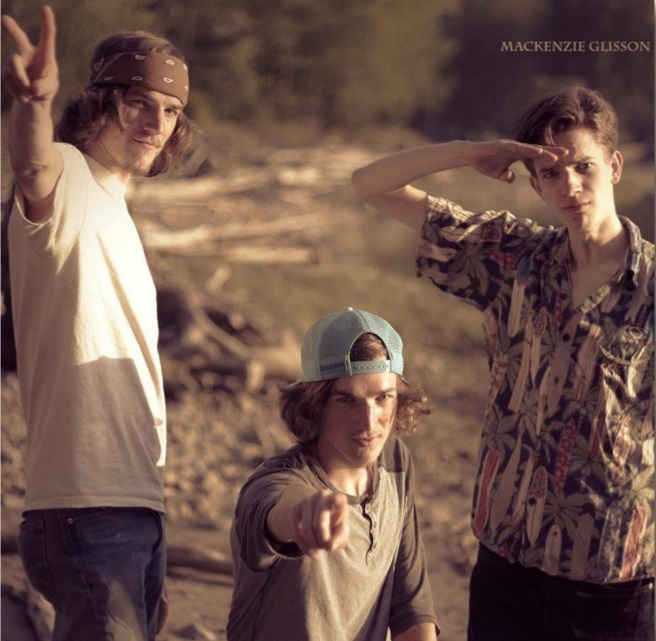 It is hailed as one of the Pacific NW’s finest soulful ensembles. Pastor Patrinell Staten Wright started the group as a gospel music class at Seattle’s Franklin High School in 1973. Since then, the choir has grown to become a nationally and internationally known gospel singing group. August 26, 9 a.m. – 3 p.m.
September 16 at 6:30 p.m. Membership Appreciation Night welcomes Fire Mountain Arts Council members to an entertaining evening of live entertainment, a bit of business, and a tasty meal. Want to be part of the fun? Join Fire Mountain Arts Council at the door, at the BCJ Gallery, or by mail. Click here for the membership brochure. Member dues for 2017-2018 is $50, and include four complimentary tickets valued at up to $10 each. The evil and greedy Medusa Dunnit has taken over the sleepy little town of Critter Crossing with the help of weak-willed Judge Wally Wessell and nasty Sheriff Black Burt Bushwacker. 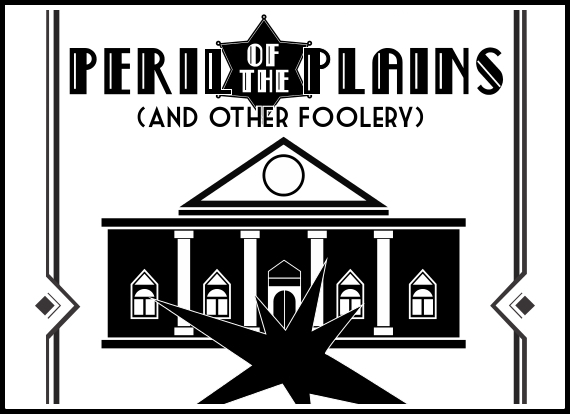 Who will step forward to help plucky Penelope Fortune save Critter Crossing’s Orphan School and Old Folks Home from these evil villains? The entertaining evening is complete with vaudeville-style comedy and music. October 14 at 2 p.m.
Errol Flynn and Olivia de Haviland in Santa Fe Trail Bing Crosby, Bob Hope, and Dorothy Lamour in Road to Bali. 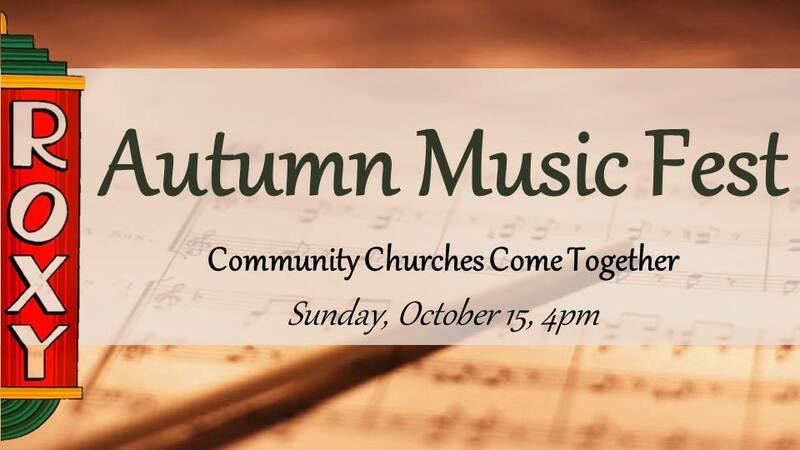 Autumn Music Fest brings soloists and ensembles from area churches and choirs together for an inspirational musical program. Sponsored by DeVaul Publishing. 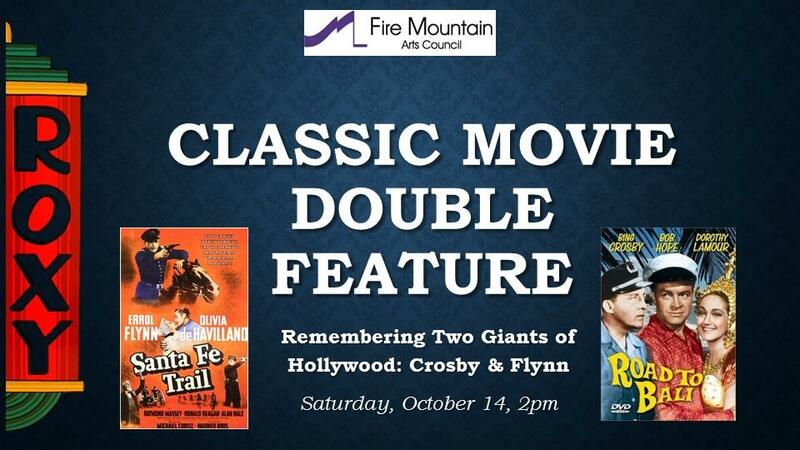 Presented by Centralia College East, Our Literacy Council, Fire Mountain Arts Council. October 18 at 7 p.m. Featuring The Stationary Stones (Glenn Cowles, Kent Raible, and special guest Steve Hoecker ) playing classic rock hits and original songs. All proceeds help Our Literacy Council provide GED Testing Scholarships for local students. Make a night of it and have dinner at Rivers Coffeehouse & Bistro prior to the concert. Rivers is donating 20% of its dinner sales. Tickets $25. Purchase by October 20. 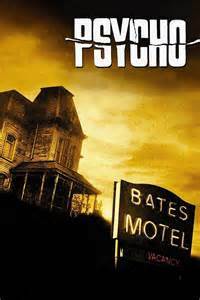 Psycho with Anthony Perkins and Janet Leigh following dinner by Creative Catering served by the Zombies. 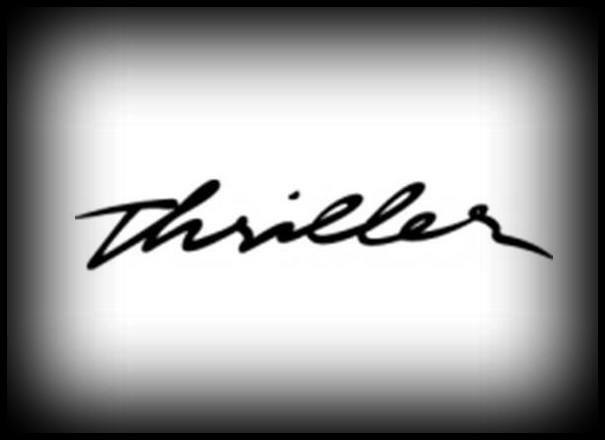 For a donation of AT LEAST $10, Morton city limits residents can have a flashmob of dancers perform the Thriller dance on your lawn on Halloween evening. Performances will start happening around town at approx. 6 pm. 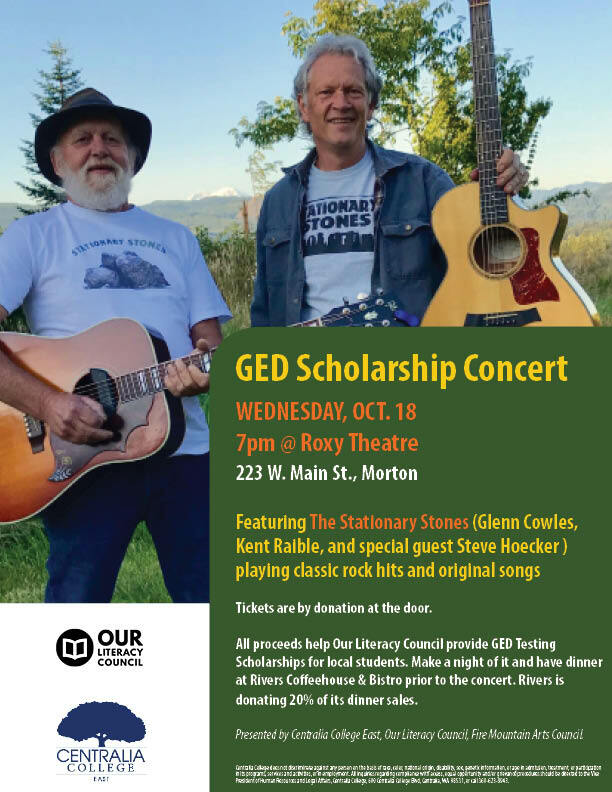 If you would like to sponsor a performance for yourself or someone else within Morton city limits, please email Genny Greiter at mortonroxyonstage@gmail.com or call her at 360-496-5060. It’s a THRILL! November 11 at 7 p.m. 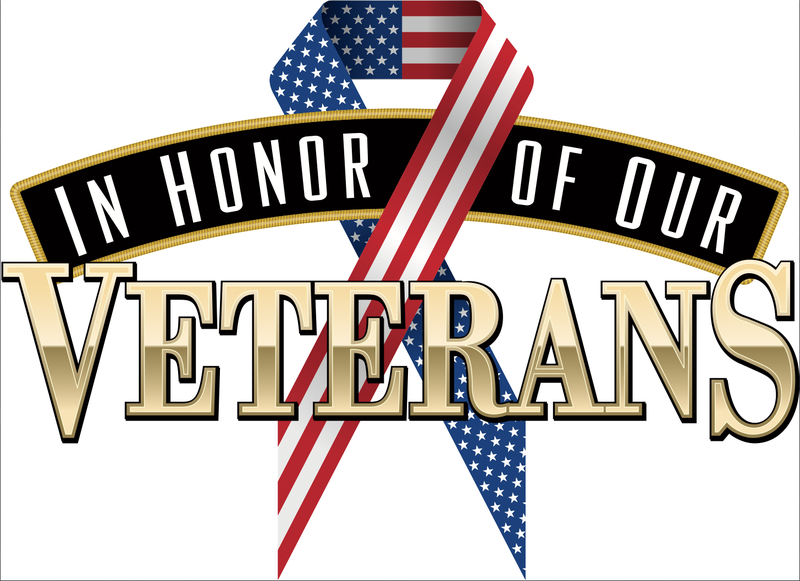 Celebrate our veterans with 1940’s USO-style entertainment: big band, dance, soloists, skits, and plenty of laughs. Festival of Trees at BCJ Gallery and the Roxy. December 7, 8 from 11am to 4pm. December 9 from 11am to auction closing at 5pm. Silent auction to benefit Barbara Clevenger Johnson Gallery: bid and vote for your favorite trees.